Arrange pears, cut-sides up, in 8-inch square microwaveable dish. Add next 5 ingredients; cover with waxed paper. Microwave on HIGH 6 to 8 min. or until pears are tender. Combine chopped cookies and nuts. 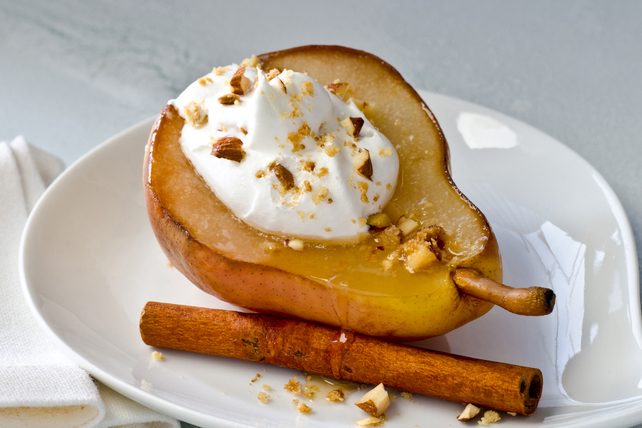 Place pears, cut-sides up, in dessert dishes; drizzle each with 2 Tbsp. of the cooking liquid. Discard any remaining cooking liquid. Top pears with nut mixture and Cool Whip. Garnish each dessert with an additional cinnamon stick. This delicious dessert, made with better-for-you products and high in fibre, not only tastes great but can also be part of a healthful eating plan.